I can't believe it has been exactly 8 months since I started this blog. Thank you to all the readers who have joined this blog, commented on my posts, provided feedback and just made it so worthwhile for me to keep this blog up and running. 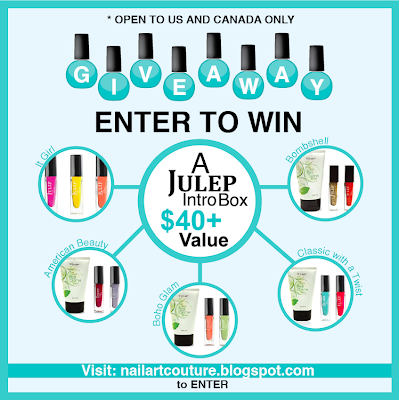 Anyways, onto what this blog post is really about... my Julep Maven Intro Box Giveaway! Yes, my very first giveaway! 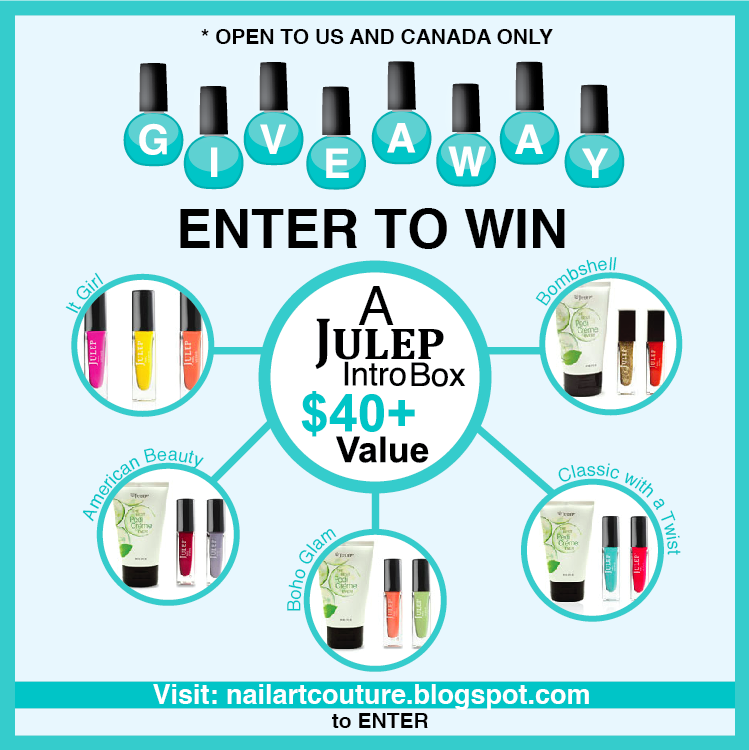 So recently, I joined Julep's VIP Blogger program. One of the perks is that they will send me an intro box of my choice to review and provide one to give to you guys! I have been a Julep Maven member since January and out of all the subscription services that I have tried, this is by far my favorite. A lot of people often complain about inconsistencies and small size products with their subscription services. However with Julep Maven, you are guaranteed a box packed with full size items that are at least $40 in value. Every month you get a sneak peek to see what products will be featured in the upcoming month. If none of the products are right for you or you don't think you can splurge $19.99 for the month, you have the option of skipping. This is the only service that I know of that allows you to peek and skip. So you will never get something you won't like! In conjunction with their many penny promos, they offer one of the best referral programs. 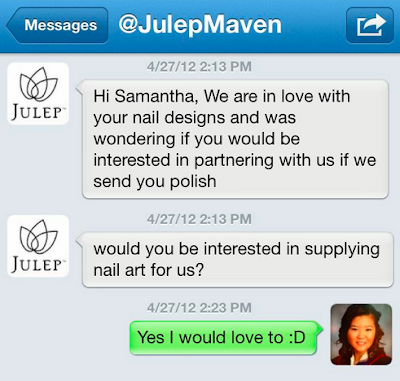 Some subscription companies won't accept referrals through a promotion, but not Julep. If you referred 2 friends to sign up with the penny intro special, you earn yourself a free month of Julep! The only requirement to keep those credits is that your referred friends need to have an active account for 30 days. What that doesn't mean is that they are obligated to purchase the regular subscription since they have the skip option at their disposal. If you tried it out and Julep isn't for you, then you can always cancel by calling the Maven Team. Now onto my unboxing and then my giveaway! This is my first Nail of the Day post. I decided I needed to take off my chipped polish and put on something new. Good bye beautiful Thakoon nail art, maybe I'll redo you someday. But I highly doubt it just because I'm the type of person who likes to do a design just once. Keeps things interesting you know? Anyways, so this morning I painted my nails with Julep Robin (robin egg blue), which came in my June Boho Glam box. For my ring fingers, I used Julep Courteney (key lime green) that came in my mom's June American Beauty Box. I am still so in love with all the colors featured this month! I had the intention of taking it off and then doing another nail art later on tonight. But then I took a detour to Sephora to exchange something. Every time I am there, I have a need to play around with their nail polishes. So I ended up using Sephora by OPI's I'm so Sari on top of Robin, which is described as "opaque turquoise with fine and chunky iridescent glitter". On top of Courteney, I used Sephora by OPI's It's Real 18K Gold Top Coat. If you have cash to burn, the top coat is $40! This reminds me of Rihanna's $5,000 manicure for the Grammy Awards. She painted her nails with a 24K gold polish! I guess if you put that into perspective, this polish is quite a steal! Hello everyone! I just want to let you know that my rack of social media nail polishes are growing and I added a Facebook polish into my collection. Anyways with all that kidding aside, I decided to create a Nail Art Couture Facebook page, just for the heck of it. Why not right? 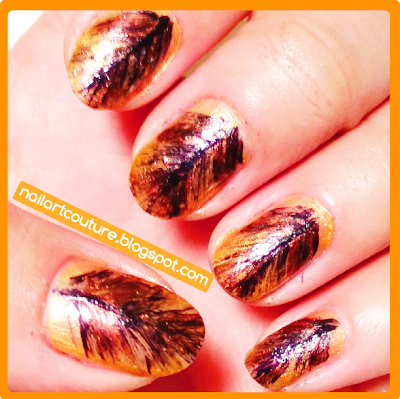 It's a good way for me to chat with you ladies and accept nail art challenges! Anyways if you like reading my blog and want to keep updated, feel free to "Like" my page. I made the banner myself, what do you think? This nail art is inspired by Thakoon 2013 Resort collection. I actually love a lot of his pieces in this collection. There are a lot of lovely color blocking and bold patterns. I settled on this dress pattern just because I thought it would be easy to replicate and I figured I haven't done any nail stamping in a while. I forgot how messy nail stamping was. I think nail art in general is messy, so I have no idea how some nail bloggers have their nails look so picture perfect. Maybe it'll look a lot better with practice or with some heavy retouching. 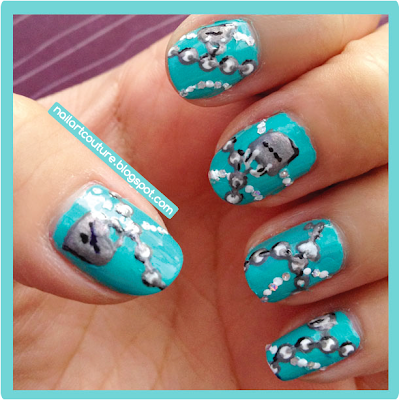 Anyways, this nail art looks complicated, but it's really easy to do. Also... it a kind of a nail art that looks better from afar. Maybe it's because my pictures show so many imperfections. Anyways, keep reading for materials and tutorial! It's here! I like to refer this as Julep Christmas Morning because it's almost like unraveling presents. The July Julep Sneak Peek is available to us, much earlier than expected actually. But I'm not complaining! This month's theme is about matching lips and nails, which happens to be the latest fashion trend. These polishes are meant to make you sparkle, so they are shimmer and glittered based. 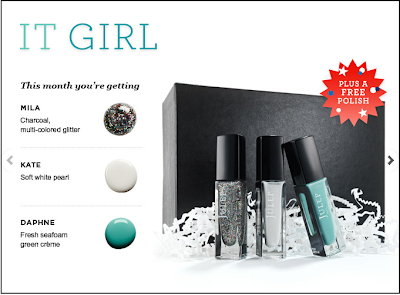 This month, Julep is being super generous to us Mavens by giving us a free polish based on our geographical location. In this month's box, you'll be expecting a minimum of 3 polishes, rather than 2. The two colors are America the Beautiful, a shiny red with royal blue glitter and sterling stars, and O Canada, a sheer glitter with accent of cardinal red. These polishes are so perfect since Canada day and July 4th are just around the corner. Also since the Olympics are going on this year, you can use these polishes to showcase some country pride! In addition to the free polish, Julep is rolling out some new lip glosses this month, or as they like to call it Lip Vernis (value $18.00). There's one with my middle name on it! If you're interested in signing up, last month I sent out my mom's referral link and a few of you purchased through it. On behalf of my excited mama, I would like to thank you guys! This post, I will share my cousin's referral link. She's working hard in med school and I hope I can help her earn some monthly treats. This is her referral link if you're interested in being a Maven: http://www.julep.com/?r=20017515 - Remember ladies, you can get your very first box for ONE PENNY. Just take the quiz, and then type in the code MAVENINTRO to to reduce the price down to $0.01. Then grab your referral link and send it to your friends! For every 2 friends you refer, you get credits toward a free box. Julep has one of the best referral program for a subscription box. I signed up with Beauty Box 5 when it was relatively new and they sold me on the fact that they featured Travalo in their PR box. I bought a box hoping that they will feature the product in their inaugural "public" box, but unfortunately they didn't. I ended up cancelling my subscription, because I didn't really love the products and I didn't enjoy the fact that some of the items were expiring. Anyways, while I canceled out of the subscription, 5 more people purchased through my referral link and so I was able to earn another month for free. I emailed the BB5 customer service to see if I still qualified for it and they said that their "sharing is caring" program is for active subscribers but they were willing to send me a box out of courtesy since I did spread their word out. Since I'm obsessed with perfume atomizers, I also made a special request to send me their Travalo if they had anymore available. My request was put through and I am so ecstatic that I got one! I am really impressed by their customer service. I don't even know if this is considered a May or a June box, since it wasn't sent out on the regular shipping schedule. Oh well, since I got it in June, I'll just call it a June Box. I'm back with another nail art and this time it's a Tiffany and co. Inspired nail art. I've had my eyes set on Essie's Turquoise & Caicos for a long time since I've read reviews that it's pretty true to the Tiffany's blue. But then Robin popped up in Julep Maven's "Sneak Peak" and I knew I had to get the box that contained it! 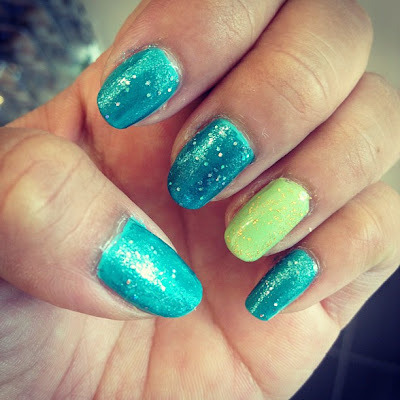 When I applied it on my nails, Julep's Robin is more plain blue, whereas Tiffany's a more greenish-blue. If you're interested in investing in a true Tiffany's blue polish, go with Essie's Turquoise & Caicos. Anyways, I knew I wanted to redo another Tiffany's design once I got my Julep Robin. If you want to check out my last attempt, click HERE. For this attempt, I wanted it to be more inspired by their jewelry than simply their color combination. So I decided to try and replicate Tiffany's iconic chain bracelet with different charms. What do you think? I did everything with a dotter and the smaller details with a toothpick. Keep reading for instructions! I thought my nails looked too bare with just the charm bracelet design so I added other embellishments to resemble other jewelry. I feel so indifferent about it, I don't exactly love it, but I don't think it look that bad either. If you want to attempt this nail art, do whatever you think looks best! Yay, my June Julep Maven box finally arrived. It's not a Golden Box that I was really hoping for, but my mom gave me her polishes so I'm a happy girl. I went with the Boho Glam this month just because, like I said in my June Sneak Peek post, I really wanted a robin's egg blue or a color similar to a Tiffany's blue. Anyways, check out the contents of my box and the colors that my wonderful mama gave me! I'm sending out my mom's referral link just because I think I gained enough credits for myself, thank you so much to those who have purchased through my referral link! Anyways if you're interested in signing up, this is my mom's refferal link: http://julep.com/?r=19023025. She'll be so appreciative and happy that you purchase through it! More than a month ago, I received an email from Julep's Twitter account asking me if I would be interested in providing them nail art if they provided me with nail polishes. Being a lover of their Julep Maven program and being a huge fan of their nail polishes, of course I agreed! I only started this blog for fun and to share my nail art with the world. Never would I imagine a company would ever contact me! It was a really exciting opportunity especially with one of my favorite nail polish company! They sent me three looks to complete using their nail polishes within my collection, and the feather nail art was one of them! I completed this nail art a while ago and they said they would feature it, but I don't think I've seen it on their website yet. This nail art seems like it's more suitable for Fall/Autumn, so maybe I'll see it then. But in the mean time, I just want to share this with my readers. Anyways, I did receive their goodies so I just want to thank the Julep team for sending it to me! I received Parker (Golden tangerine creme) and Sienna (Sophisticated, shimmery gold), as well as top coat and a base coat! In addition, they sent me a lovely hand written note. 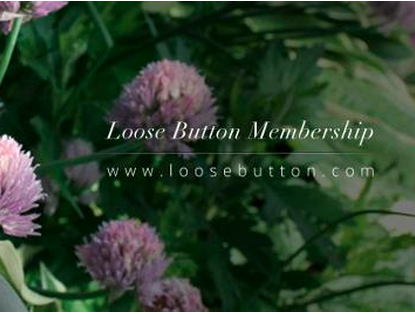 Loose Button is evolving and we'll no longer see a monthly beauty box, but rather 4 "seasonal Luxebox". I'm telling you now, I'm not loving the change. Instead of delivering 4 to 5 products a month, they're delivering 7 to 8 products every 3 months (February, May, August, and November). I know a lot of people haven't been happy with the products in their Luxe Box, so with a Seasonal box, I guess there will be fewer months for subscribers to be upset if the box isn't up to par! In addition to the products, subscribers will receive members-only perks, such as invitation to private events, product launches, and special offers. Loose Button is the only beauty subscription company that holds these types of events. I was really sad that I missed out on their summer trends event! Finally, members will get exclusive content, such as tutorials and beauty tips so that members can make the most out of the products they receive. If these tips and tutorial are from brand and beauty experts, then I think that would make a great addition. But I wouldn't find a lot of value in it if I can easily find something similar online. The prices of the membership plan have changed as well. So now it's $26 per quarter, $50 semi annually ($25 per box), and $96 ($24 per box) for an annual subscription. Before, it was actually worthwhile to sign up for an annual subscription because you can receive a free box. But with the $2 difference between a quarter and the annual subscription plan, I think it would be more ideal to pick the former just because you don't have to feel "locked in". Click HERE, to watch a video of the founders talking about Loose Button's new membership. For more information, please keep reading.